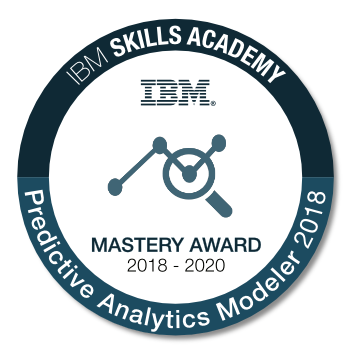 The badge earner has a proven expertise to forecast and predict future probabilities and trends, and analyze insights from your data, using IBM SPSS Modeler. The badge earner has demonstrated advanced proficiency on topics such as data preparation, data mining, data collection & integration, nodes & streams, deriving & reclassifying fields, predictive models, and statistical analysis. Must be the following: a student; faculty member from a higher education institution; or IBM Customer, Business Partner or IBM employee. All badge earners must be either attending or are involved in the IBM Skills Academy Program. Passing the IBM Proctored Exam for "Predictive Analytics Modeler 2018".